"41AN1-25, Burial E-5" by Timothy K. Perttula and Robert Z. Selden Jr.
DECORATION: The rim and lug handles are decorated with vertical rows of pinching. The body has four repeating pinched circles centered under the lugs. 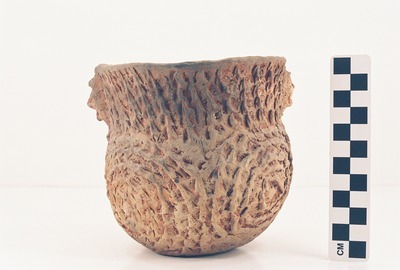 Killough Pinched jar (Vessel 41AN1-25).